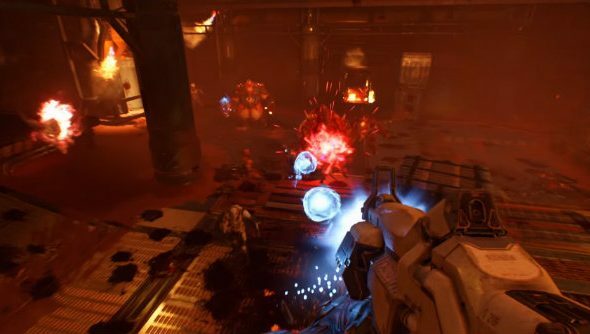 Doom’s open beta will run from April 15-18, and will give players access to Team Deathmatch and Warpath modes on the Heatwave and Infernal maps. Post-launch plans have also been revealed, like the intestines of a demon after a shotgun shell to the gut. We’re one step close to finding out if we’ll get two Doom games on our list of PC’s best FPS games. The post launch plans seem very multiplayer focused, which hints at a certain confidence in the game’s online modes. I suppose we’ll all find out whether that confidence is well placed when we’re all playing the beta in just over a week. There will be a bunch of free updates coming post-launch, many of them focused on improving SnapMap, Doom’s user-generated creation engine. Id Software plan to add new map modules; props and objects; additional features and functionality; AI enhancements; editing tool enhancements and more to the creation tool. New game modes are also planned as free updates for the multiplayer. Of course, there will also be three premium multiplayer DLC packs, which will get you a number of new maps, hack modules, playable demons, weapons and more. The first DLC will be available this summer and give you access to three new maps, one new weapon, one new playable demon, one new armour set, one new piece of equipment, new hack modules and taunts and new customisation colours and patterns. Each DLC pack will cost $14.99. Hopefully there’s some single-player DLC on the horizon too, as that’s what I’ll be playing Doom for mainly. I’m especially not too keen on the idea that people who buy DLC will have an exclusive weapon, armour and other advantages. We can only wait to see how much this affects competitive play after the game’s launch on May 13.